6925-20.53 Little Feet Radio With music From Warren Zevon" werewolf's of London". Fair Signal Sinpo 43433. Closed Down A Few Minutes Later. 6798(lsb)-21.35 Radio Mistero Ghost Plant With Music From Nena" 99 luft balloons". Moved To 6803 To Avoid Some SSB Qrm. Weak To Fair Signal Sinpo 33233. First Time To Hear This Station. 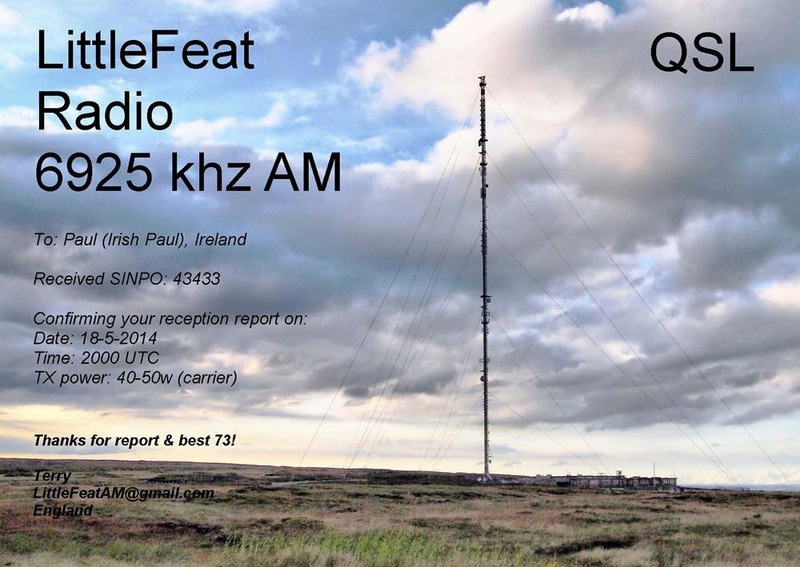 E-Qsl From Little Feet Radio. 7490-10.02 Geronimo Shortwave In Parallel With 9485 Dave Scott With Music From Dire Straits, Supertramp And The Doors For Chris Watson. Strong Sinpo 54444. Good Signal On 9485. 6244-20.55 Radio Pandora Playing Oldies Including Perry Como" magic moments". Also Said He Had Put In A New Compressor. Fair Signal, Occasional Fading Sinpo 43323. Good To Hear Radio Pandora On Again. 6214(usb)-21.15 Radio Minipower With Music From Donna Summer" hot stuff" And Lipps Inc." funky town". Fair Signal Sinpo 43333. First Time To Log This station. UK Dxer Has Updated His Site. Paul(UK Dxer) Has Updated His Website. 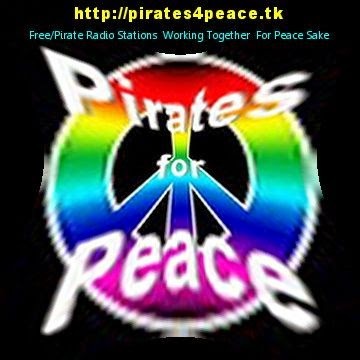 You Can Find All The E-Mail Addresses For Pirate Radio Stations On SW And MW Here And Much More. Why Not Take A Look, You Won't Be Disappointed. Radio City will be on the air Today Friday May 16 at 18 - 19 GMT via IRRS on 7290 kHz and via Challenger Radio on 1368 kHz, with a repeat via IRRS on Saturday May 17 at 08 - 09 GMT on 9510 kHz. Next Saturday there is the monthly transmission via Hamburger Lokalradio at 12 - 13 GMT on 7265 kHz. Every Saturday evening there is a separate programme via Radio Merkurs in Riga, Latvia on 1485 kHz at 19 - 20 GMT. Geronimo Shortwave Sunday 18th Broadcast. This coming Sunday 18th there is a special dual band broadcast of Geronimo Shortwave starting at 10am UK time. ( 2 hrs ). however,the last hour of the broadcast the Dave Scott program should be in parallel. Other presenters will be Dave Simpson and Stewart Ross. 6285-21.20 Unid Playing Rock Music Including Ac/Dc. Strong , But Over Modulated Signal Sinpo 54444. Closed Down With No Id Giving Out. 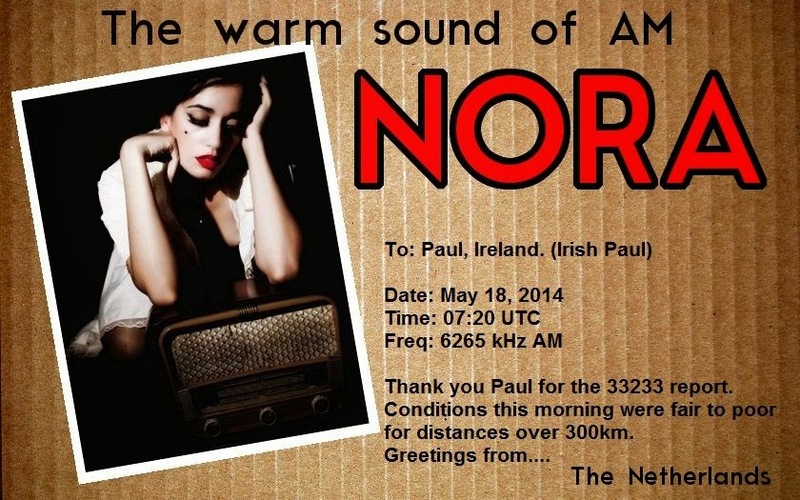 This Sunday May 11th the Swedish DX Federation has a relay via 1485 kHz between 19.00 - 20.00 UTC. 6725-19.22 Radio Tower Playing Dutch And Polka Music. Strong Signal Sinpo 54444. Also On 1611. 6207-19.32 Hit Mix Radio Playing Dutch Music. Weak Signal Sinpo 32322. Closed Down A Few Minutes Later. 6285-18.15 Delta WB Playing Dutch Music. Fair Signal Sinpo 43333. Said He Was Using 30 Watts. After a few months' silence FRS-Holland will be on air with a test next Sunday May 4th. Correct reports will be verified with our standard color QSL showing the offical FRS logo. Currently we are working very hard to have the brand new FRS website online some time this Summer.